Spend $50 at Costume City and get free shipping on your order. Click link for savings. Shop online at CostumeCity.com for plus size costumes and save up to 30%. Check out the sale section at Costume City and save up to 70% off a wide range of Halloween costumes. Act now and get your baby's costume from CostumeCity.com, from as low as $9.95. 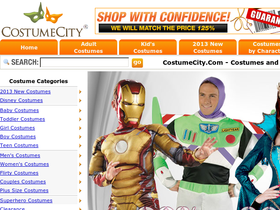 Find a lower price somewhere else and Costume City will match the price by 125%.